Travel with expert Museum guides to spectacular locations, explore wild parks and world heritage sites, tour behind the scenes at great museums, mingle with the locals, feast your senses on the wonders of nature, and become a citizen of the world. Our Adventures are open to all Museum members. Journey with us from Belize to Yellowstone National Park and learn from our educators and scientists as they learn from you. Join today! Immerse yourself in the tropics by joining us on this “mountains to sea” journey. From watching beautiful birds in the steamy jungle, to swimming with brilliantly colored fish on the world’s second largest coral reef, this trip is designed to excite, inspire and delight your senses. 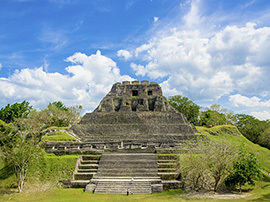 Escape the doldrums of winter with a Central American adventure sure to replenish your spirit.